Bead-beating tubes with 1 g ceramic filling (1.4 mm) for tissue soft homogenization (equivalent for Lysing Matrix D). Tubes are available in two different shapes. The homogenization tubes are included in the EXTRACTME DNA TISSUE PLUS (EM04) and EXTRACTME TOTAL RNA PLUS (EM11) kits. 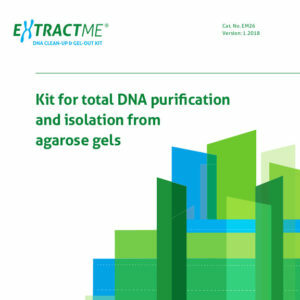 The EXTRACTME DNA CLEAN-UP & GEL-OUT KIT is designed for a rapid and efficient purification of DNA fragments after enzymatic reactions and directly from agarose gels (standard and low-melting point agarose gels run in either a TAE or TBE buffer). It efficiently removes nucleases, enzyme inhibitors, detergents, restriction enzymes, polymerases, divalent ions, agarose, ethidium bromide and other contaminants. The purified DNA can be used in common downstream applications. The kit enables the purification of DNA fragments from 50 bp to 20 kb, as well as plasmid and genomic DNA. However purification of fragments smaller than 100 bp and larger than 10 kb will result in decreased recovery rates. The purification protocol and buffer formulations were optimized for high yields and purity of DNA. The product is intended for research use only. 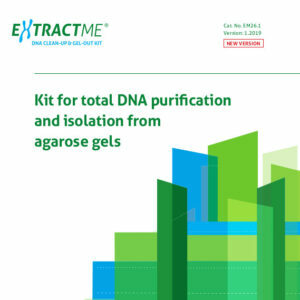 The EXTRACTME DNA CLEAN-UP & GEL-OUT KIT is designed for a rapid and efficient purification of DNA fragments after enzymatic reactions and directly from agarose gels (standard and low-melting point agarose gels run in either a TAE or TBE buffer). It efficiently removes nucleases, enzyme inhibitors, detergents, restriction enzymes, polymerases, divalent ions, agarose, ethidium bromide and other contaminants. The purified DNA can be used in common downstream applications. The kit enables the purification of DNA fragments from 50 bp to 30 kb, as well as plasmid and genomic DNA. However purification of fragments smaller than 100 bp and larger than 10 kb will result in decreased recovery rates. The purification protocol and buffer formulations were optimized for high yields and purity of DNA. The product is intended for research use only. 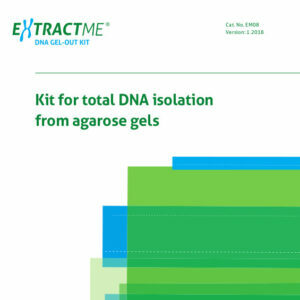 The EXTRACTME DNA CLEAN-UP & GEL-OUT MICRO SPIN KIT is designed for a rapid and efficient purification of DNA fragments after enzymatic reactions and directly from agarose gels (standard and low-melting point agarose gels run in either a TAE or TBE buffer) with an extremely low elution volume of only 5 μl. It efficiently removes nucleases, enzyme inhibitors, detergents, restriction enzymes, polymerases, divalent ions, agarose, ethidium bromide and other contaminants. The purified DNA can be used in common downstream applications. The kit enables the purification of DNA fragments from 35 bp to 30 kb for clean-up procedure and from 100 bp to 30 kbp for gel-out procedure, as well as plasmid and genomic DNA. However purification of fragments smaller than 50 bp and larger than 10 kb will result in decreased recovery rates. The purification protocol and buffer formulations were optimized for high yields and purity of DNA. The product is intended for research use only. The EXTRACTME DNA CLEAN-UP 96-WELL KIT is designed for the rapid and efficient purification of DNA fragments after enzymatic reactions. It efficiently removes nucleases, enzyme inhibitors, detergents, restriction enzymes, polymerases, divalent ions, salts etc. The purified DNA can be used in common downstream applications. The EXTRACTME DNA CLEAN-UP 96-WELL KIT enables the purification of DNA fragments from 50 bp to 30 kb, as well as plasmid and genomic DNA. However purification of fragments smaller than 100 bp and larger than 10 kb will result in decreased recovery rates. The purification protocol and buffer formulations were optimized for high yields and purity of DNA. The product is intended for research use only. 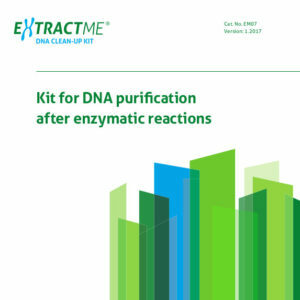 The EXTRACTME DNA CLEAN-UP KIT is designed for a rapid and efficient purification of DNA fragments after enzymatic reactions. It efficiently removes nucleases, primers, enzyme inhibitors, detergents, restriction enzymes, polymerases, divalent ions, salts, mineral oil, etc. Purified DNA may be used in common downstream applications. Primers from PCR reactions are eliminated quantitatively while small DNA fragments are still bound and purified with high recovery. The kit enables purification of DNA fragments from 50 bp to 20 kbp, as well as plasmid and genomic DNA. The purification protocol and buffer formulations were optimized for high yields and purity of DNA. The product is intended for research use only. The EXTRACTME DNA CLEAN-UP KIT is designed for the rapid and efficient purification of DNA fragments after enzymatic reactions. It efficiently removes nucleases, enzyme inhibitors, detergents, restriction enzymes, polymerases, divalent ions, salts etc. The purified DNA can be used in common downstream applications. The kit enables the purification of DNA fragments from 50 bp to 30 kb, as well as plasmid and genomic DNA. However purification of fragments smaller than 100 bp and larger than 10 kb will result in decreased recovery rates. The purification protocol and buffer formulations were optimized for high yields and purity of DNA. The product is intended for research use only. The EXTRACTME DNA GEL-OUT KIT is designed for a rapid and efficient purification of DNA fragments directly from agarose gels (standard and low-melting point agarose gels run in either a TAE or TBE buffer). Agarose, ethidium bromide and other contaminants from a sample are effectively removed in the purification process. The kit enables the purification of DNA fragments from 50 bp to 30 kb, as well as plasmid and genomic DNA. However, purification of fragments smaller than 100 bp and larger than 10 kb will result in decreased recovery rates. The purified DNA can be used in common downstream applications. The purification protocol and buffer formulations were optimized for high yields and DNA purity. The product is intended for research use only.